In love with Formula 1: Mexico GP: Hamilton secured his fourth world championship! Mexico GP: Hamilton secured his fourth world championship! I´m writing this blog post not until a week after the Mexico GP. That´s because my world has turned upside down after my 11-year-old son was diagnosed with cancer two weeks ago. I spent last weekend at the hospital with him, as he was given his first treatment. I watched both the qualifying and the race on my cell phone, but since my son was feeling very sick, it was very hard to concentrate on anything else. In terms of the pecking order, the qualifying was certainly interesting. The Mercedes teammates Hamilton and Bottas were topping the timesheets in Q1, the Finn being only six hundredths of a second down on his teammate. However, the real eye-catcher was McLaren´s Alonso, who made it fifth in the first segment, being only 0.29s down on pace-setting Hamilton. In Q2 it was Red Bull´s Verstappen, who was absolutely flying. After the first runs the Dutch Red Bull ace was massive half a second faster than Hamilton. However, teammate Ricciardo seemed unable to match his teammate´s pace, the Australian being as much as a second off Verstappen´s pace. Sebastian did a fantastic job as well, as the German jumped second on his second run, only 0.3s off Verstappen´s pace. In the last segment it was obvious, that Verstappen was extremely hungry for pole. The flying Dutchman took provisional pole by 0.259s to Sebastian. I already thought, that Max was going to grab his maiden pole! Hamilton was third, whereas teammate Bottas was unable to set a lap time on his first flyer, as Verstappen impeded him. However, no penalties were given. Kimi was only 8th after his first run, and the Iceman was massive 1.6s off Verstappen´s pace. It was on the second runs, when the magic happened. Sebastian put together a phenomenal lap with a perfect first sector (where he had previously lost time compared to Verstappen) and grabbed pole by 0.086s to Max! What an outstanding lap it was! Max was so gutted for being deprived of his first-ever pole! Hamilton had to settle for P3, the Briton being four tenths down on pole-setting Sebastian. Teammate Bottas completed the second row. Kimi qualified in P5, surprising 0.75s down on his teammate. Ricciardo had mystically lost his pace in the qualifying, as the Australian was only able to make it 7th. This was the first pole for Ferrari in Mexico since 1970 and the 50th career pole for Sebastian! The start was absolutely breath-taking. In Turn 1 my heart jumped into my mouth, as Sebastian first hit Verstappen and then Hamilton! The Briton got severe front wing damage and a puncture and had to pit immediately. Sebastian, too had a significant damage to his front wing, and he had no other option but to pit for a new nose. Both drivers opted for a fresh set of yellow-marked soft tyres. What a start to the race; both title contenders had dropped down to the back of the pack! Verstappen instead was leading the race with Bottas second and Force India´s Ocon third. Kimi had also dropped down at the start, losing positions to Ocon, Perez and Hulkenberg. The Iceman was in P7. Ricciardo´s difficult weekend continued, as the Australian had to retire already on lap 6 due to a power unit issue. By lap 21 both Force Indias and Renault´s Hulkenberg had pitted, which benefitted Kimi, who had a longer first stint. The Iceman moved already third! On lap 22 there was a bizarre moment, as race leader Verstappen lapped Hamilton, who was shown blue flags! This definitely hasn´t happened too often in the previous years. Three laps later it was teammate Bottas´ turn to lap his teammate. By lap 29 Sebastian had already made his way through the field to P10. But it wasn´t enough! Sebastian needed P1 or P2 to keep his title hopes alive! Lap 33 saw a hectic pit stop roulette. Both Verstappen and Bottas pitted from the lead, both opting for the red-marked supersoft compound. Kimi pitted, too -but for a fresh set of soft Pirellis. Hamilton pitted for the second time already, for supersoft Pirellis. So did Sebastian, choosing an aggressive strategy. 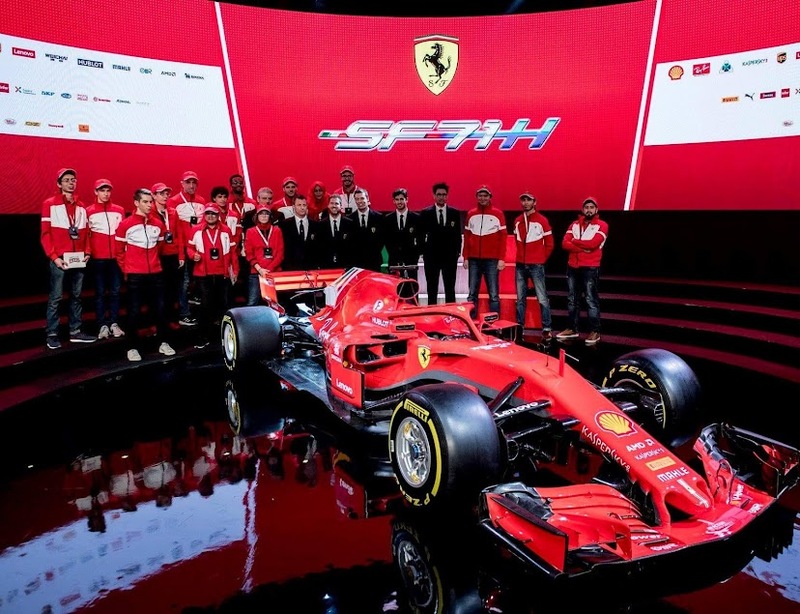 The German Ferrari ace opted for a fresh set of purple-marked ultra soft tyres, which foreshadowed a flying last stint. Towards the halfway point of the race Verstappen was still leading the race, followed by the Finns Bottas and Räikkönen. Ocon was fourth and Williams´ Stroll fifth. By this time Sebastian had already made it up to P8. Hamilton had had it difficult to make it through the field, and the Briton was stuck in P15. With 20 laps to go, Sebastian made an aggressive overtaking move on Force India´s Perez and jumped 6th already. Sebastian seemed absolutely determined to fight for every point available. Four laps later Sebastian made a self-confident move on Williams´ birthday boy Stroll, who proved unable to prevent storming Sebastian from taking the fifth place. Lap by lap it seemed more inevitable, that Hamilton was going to clinch his fourth world championship at the end of the race. On lap 57 Hamilton moved 10th, whereas title rival Sebastian stormed past the pink Force India of Ocon, jumping fourth in the race. Teammate Kimi was in P3 but already 24 seconds ahead of Sebastian. The German kept banging fastest lap times, but the gap was too big. There was nothing Sebastian could do to make it higher than P4! With three laps to go, Hamilton managed to overtake Alonso after a tight fight and move 9th. Verstappen took stunning third victory in a dominant style. I was very happy for the flying Dutchman; he definitely has magical talent and raw speed! Bottas finished second, and Kimi made it two Finns on the podium. After the first-lap collisions Sebastian drove a brilliant race, although P4 wasn´t enough to keep the championship hopes alive. Ocon finished 5th, Stroll impressive 6th, Perez 7th and Haas´ Magnussen 8th. P9 made Hamilton the first-ever British F1 driver to win his fourth world championship! That is an impressive achievement indeed. Even though we already know the name of the 2017 world champion, there are two more rounds to go. I don´t know, whether I´ll be watching those at home or at hospital, but I´ll always keep my fingers crossed for my red-suited heroes. Hope to see tight wheel-to-wheel racing in the remaining races! Brazil GP: Sensational victory for Sebastian!